BLOOMSDAY IS A special day for a lot of people every year, but this year the event – which celebrates the work of James Joyce – will be the first that the festival can use previously restricted works. Up until 1 January 2012 anyone who wished to read any of the author’s works in public or use excerpts from it had to seek permission from Joyce’s grandson Stephen, who controls his estate. The National Library, where Joyce studied, wrote and set part of Ulysses, is holding a series of free events including a talk by Senator David Norris, musical entertainment and readings of extracts of the book. 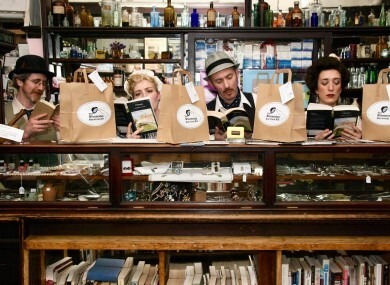 The Irish Writers’ Centre are attempting to mark Bloomsday by breaking a world record. They started a reading marathon yesterday morning at 10am and writers will be reading for 15 minutes each from their own books for a total of 28 hours. The current record is held by the Berlin International Literature Festival. The event is streaming live online here. If you’re planning to partake in some of the Bloomsday festivities you might be interested in investing in a Bloomsday Survival Kit which features a 50-page illustrated manual and props to help you recreate Ulysses. All proceeds are supporting Sweny’s Chemist, which is an original Joycean location. Bruff in Limerick is hosting a festival entitled ‘The Bloomsday of the West of Ireland‘. It’s the fourth year of the festival and today the town returns to 1904, with street events, some newly commissioned street drama, a Joycean Breakfast and The Bloomsday Dinner. The James Joyce Centre on North Great Georges Street will be hosting its annual Bloomsday festivities with tours, photographers and readings. The inaugural Dublin James Joyce Festival is already underway but some of the highlights of the event take place today with a screening of 1967′s big screen adaptation of Ulysses in Meeting House Square tonight, A Portrait of the Artist and Joyced! at the New Theatre, The Full Bloom Cabaret at La Docle Vita in Temple Bar. For more details see here. Students from Boston College have spent three years producing a Ulysses iPhone app called ‘JoyceWays’ which has been made available in time for Bloomsday. The app has been developed by Dublin company Big Top Multimedia and provides a guide to over 100 locations in Dublin, following in the footsteps of Leopold Bloom. You’re also invited to show up at the bandstand in Stephen’s Green for an afternoon of readings and songs from Ulysses. Admission is free but there will be limited seating. Email “What the Blooming hell is going on today?”. Feedback on “What the Blooming hell is going on today?”.